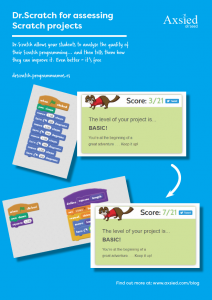 There are some obvious ways to assess Scratch programs. One of these is to grade a project or give a test which asks to match Scratch code with the result. These methods are great, but there are some big problems with them. The solution to this problem is Dr.Scratch. I first saw this software/website being shown by the creators at the WiPSCE 2015 conference hosted by King’s College London and Sue Sentance. I can assure you that the people who made it are really nice and letting schools use it for free. In fact, they will even take feedback to make it even better. 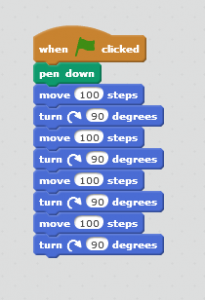 This is the simplest code for a child to achieve a square. It shouldn’t get a high mark though. 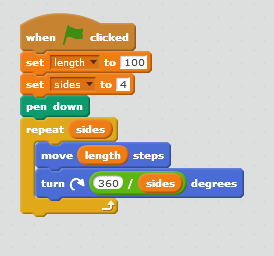 A change in the size of the square means lots of changes to the code and chances to make bugs. Quite rightly, the code gets a score of only 3/21. Most importantly, it shows areas where the program could be improved. 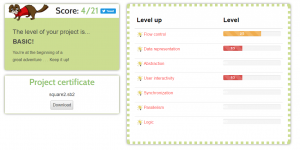 Many of these aren’t relevant to this program, but there are certainly ways in which we can improve the programs flow control, data representation and abstraction. By using repetition, we no longer repeat the same lines of code again and again. This is great for making the code more readable, easier to fix, and reduce potential bugs in the future. The beauty of Dr Scratch is that is has increased the score AND shown that my flow control skills have improved. We haven’t used any variables. This is bad, as we want to try and generalise the algorithm as much as possible. The above algorithm will only work for a square that is 100 wide. What about polygons or bigger squares – this algorithm just can’t do them. 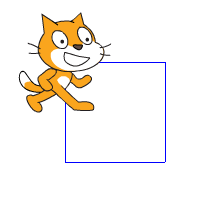 With variables though, we can adapt the code to draw polygons of any size – just by changing the variable number… And Dr.Scratch gives us another point in the data representation category. So now we build a new block (this is actually a procedure/method) called square which takes a length as a parameter. We use that length in the algorithm. Now our 4th attempt is incredibly easy. The program on the left is what we wanted to do – put the pen down and draw a square of length 100. Yes we had to tell the computer the algorithm to solve that problem, but now we have done it, how easy is it to draw squares of any size at any point we need to in our program. Also, how easy will it be to read the code. 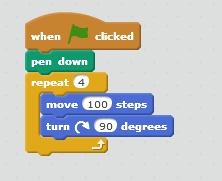 Finally, if there is a mistake in the algorithm, then fixing it once in the one block will fix it everywhere in the program… and Dr.Scratch thinks that if the method used to draw a square follows good programming principles, you deserve far more marks than one which doesn’t – which is why Dr.Scratch is a great addition to Scratch assessment. If you’ve used it in your class, or want to suggest ways to improve the square program (I can think of one), then write a comment below. 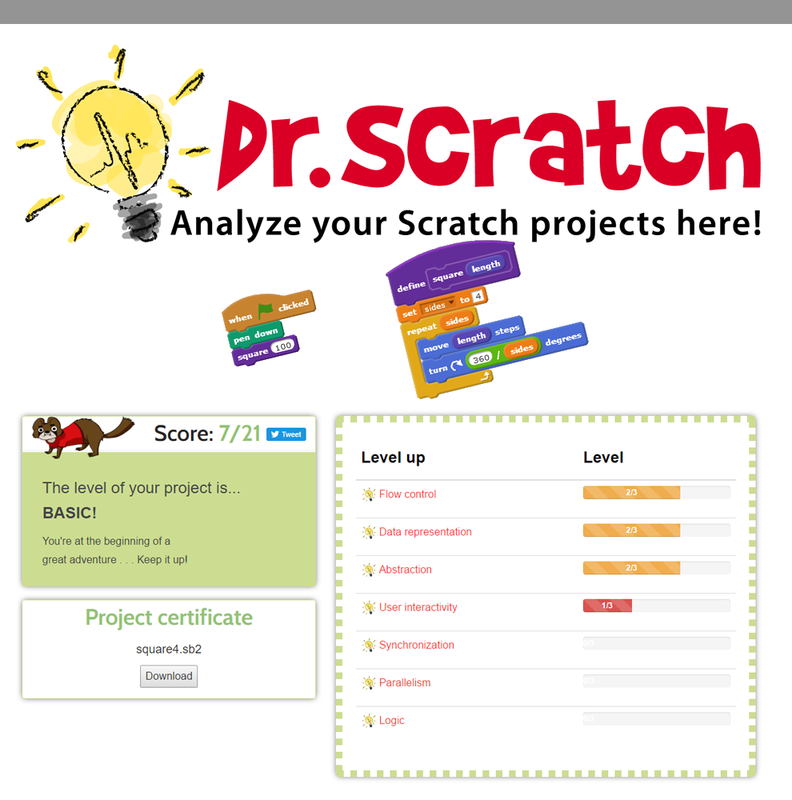 I am trying to learn how to assess my students Scratch programs using Dr. Scratch. Upload the project with the link on the right (or if it is on the web, tell it the web address). It then analyses the program and gives a score. I got the students to analyse half way through the development of the program and stick the result along with their program into an exercise book. I then got them to focus on features to improve their scores. At the end of the project I got them to stick another analysis from Dr.Scratch into their books along with their program again. 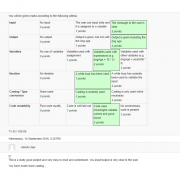 For their project mark I had a rubric to mark the rest of their project (features like gameplay) and give an overall grade. Dr.Scratch was good for sparking conversations in the lessons. For instance, how would using a procedure (new block) help them? Or use of variables? It made them realise that there was more to Scratch than what they had done in their previous school, and it also helped me to only introduce concepts that each individual student (or a small group) was capable of coping with.